Once again, I participated in the Annual Artisan's Show and Sale in downtown Leavenworth this past weekend! The Show and Sale was held on November 9th and 10th at First City Photo. The artist reception was held on Friday from 5 to 8 p.m. and the show continued on Saturday from 10 a.m. to 3 p.m. Here is a photo of my reproductions sale table! Some very exciting news - Quick Cure Clay (QCC), the clay I helped Dr. John Pojman develop, is now being licensed by Ranger Industries! Ranger has products in nationwide stores like Michael's, so it might not be long before you can find it for sale in your neighborhood. Here's a Greater Baton Rouge Business Report article about the deal (and about other startups that LSU is incubating). You can see the product listing on Ranger's site as well! I am so happy about this! The clay is such a pleasure to work with that it really deserves market success. And speaking of the clay and how nice it is to use, I've been working on another relief piece recently... more on that soon! This is such a nice surprise - the Jardin Botanique (the Botanical Garden) of Marnay-sur-Seine, France, liked my greeting cards so much that they decided to purchase a bunch of them to sell in their gift shop! So there are now multiple locations where you can buy some of my reproductions in person - in downtown Leavenworth, KS, or in Marnay-sur-Seine, France! 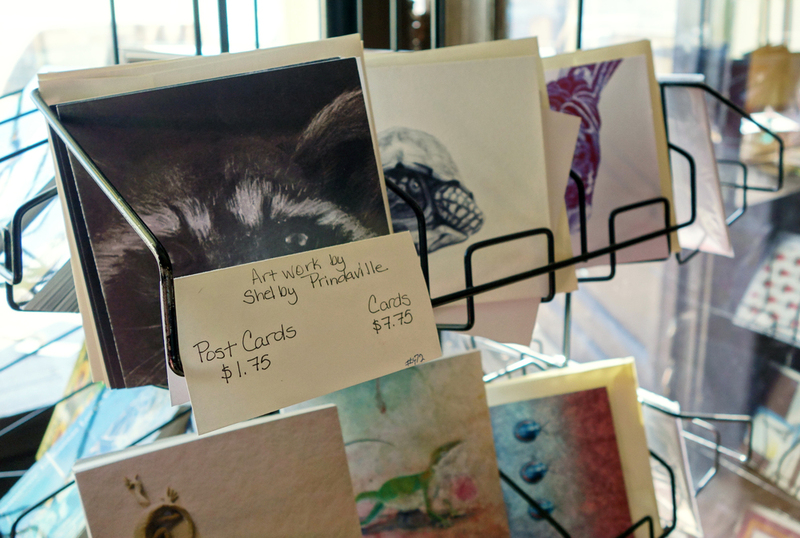 On Cherokee Street between Broadway and 7th Street (though basically on the corner of Cherokee and 7th) in downtown Leavenworth, KS, are three connected shops that sell my original artwork and reproductions: Lavender Moon, Rusty Elegants, and Meriwether's. In addition to my pieces and depending on which store you're in, you can also buy new vintage-inspired clothing and jewelry, other artists' work, and antiques, as well as order coffee, breakfast, brunch, lunch, or an early dinner while surrounded by a casual gallery setting. All three shops are still relatively new - Meriwether's is the newest - and are part of the exciting revitalization of downtown Leavenworth that's been progressing since I moved here a little less than three years ago. If you're in the area, you should stop by! A new hybrid store has opened up in downtown Leavenworth, KS - it's a composite vintage-inspired clothing retailer and antiques shop that also has a section devoted to gallery space and home decor. The clothing part is called Lavender Moon, and the rest of the business is run under the name Rusty Elegants. They will be selling my artwork and reproductions of my artwork (currently greeting cards and postcards but likely prints and other reproductions), so if you happen to be in Leavenworth you should stop by!